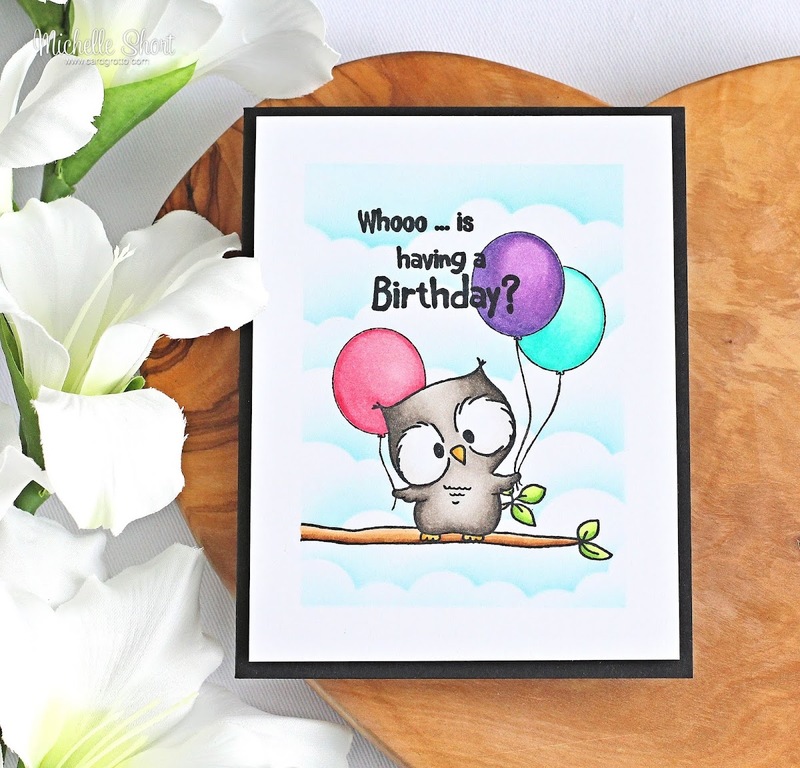 The Card Grotto: Gerda Steiner Designs | Whooo Is Having A Birthday? 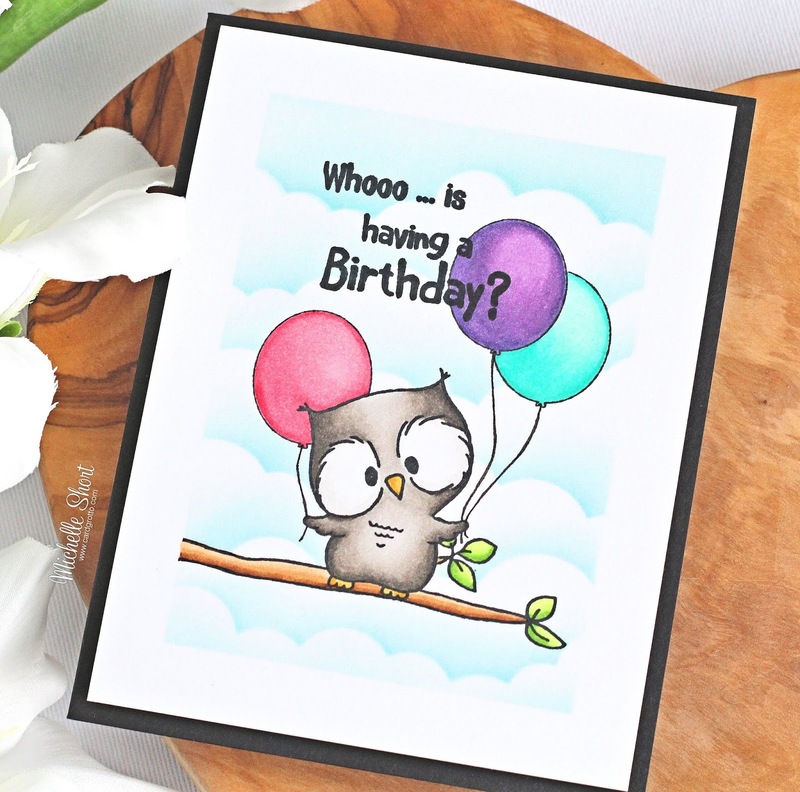 Gerda Steiner Designs | Whooo Is Having A Birthday? Hello there, I am delighted to be guest designing with Gerda Steiner Designs today. They kindly sent me the Owl Rather Be With You stamp set to play with and let me tell you, it is so cute! Great for so many different occasions. I started off my card by taking a panel of white cardstock and stamping one of the owls from the set on to it using Memento Tuxedo Black Ink. I then masked this off and stamped the branch below him so that it look like he is standing on it. I masked this off also and then stamped three balloons from the Happy Hoppy set above. These again were masked off as I went. I then added masking tape around the sides of the panel. I took the MFT Mini Cloud Border Stencil and using an ink blending tool, blended Broken China Distress Ink across the background to create a sky. All the masks were removed and the sentiments stamped with more black ink. The images were coloured with Copic Markers (the colours I used are listed below). The panel was then added to the front of an A2 black card base with foam sheet and DST. For the inside, I took another panel of white cardstock and blended clouds on to this too. 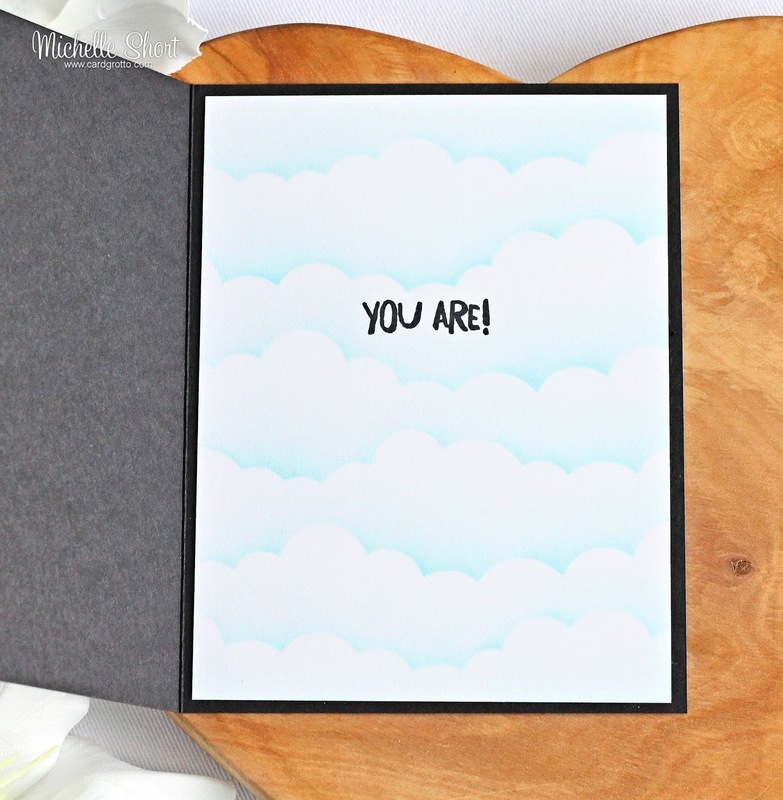 I then stamped the sentiment with black ink to complete the sentiment from the front of the card. 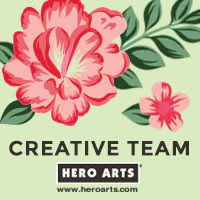 I had such great fun creating the card that I decided to create a little tag too. I die cut the rounded tag from the Clearly Besotted Tag Along set from white cardstock and blended clouds on to this, as I did with the card. 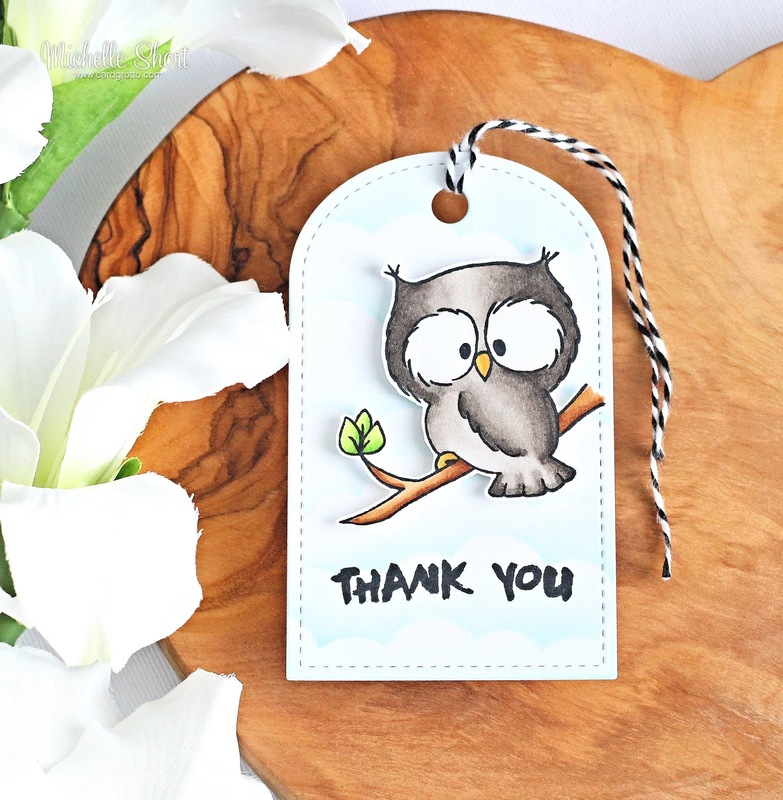 I then stamped the 'thank you' sentiment from the Brush Bunny set along the bottom. On a separate piece of cardstock I stamped another of the owls from the Owl Rather Be With You set, coloured with Copic Markers and fussy cut out (although there are dies available). This was added on to the tag with foam tape. To finish off, I added twine through the top of the tag. COPIC MARKERS: Owls - W7, W5, W3, W2, W1, W00, Y26, YR24, Y28. Branches - E57, E55, E53. Leaves - YG17, YG23, YG01. Balloons - R85, R83, R81/BG13, BG11, BG10/V17, V15, V12. Aren't those owls adorable?! Thank you so much for visiting me today, I really do appreciate it. 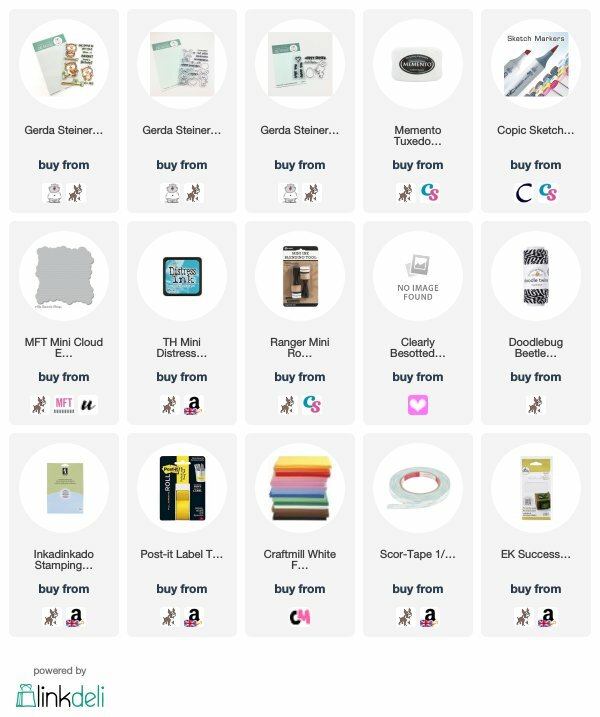 For more inspiration using Gerda Steiner Designs products, please do visit their blog. Have a great rest of the day! Brilliant card & tag, great colour work & masking. I love Gets a Steiner, she was the designer of the second stamp set I ever brought, ( only crafting 12 months). 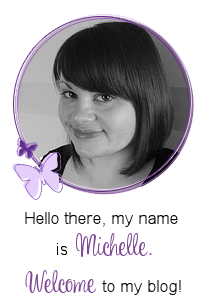 Can't wait to see your next project Michelle, keep up your amazing work I love your stuff.